Muffin Top combines the attributes of a Belgian Tripel with a huge burst of American hops. Intense flavors from the Belgian yeast, reminiscent of candied fruits, mix with the hop bitterness and sweet orange peel to create a unique take on a Belgian-Style ale. Wow really cool beer a Belgian style tripple IPA hmmm well the apperance is great. The smell is strong and sweet as is the smell. Mouthfeel is also really strong as well but not bad. Overall I think this is one worth trying and is really good. I know Art work isnt a category but the one on this label is pretty cool. Poured from a 22 ounce bottle into a tulip glass at Capitol Tap Room. A: Great lacing. Golden hazy. S: Citrus peel and floral sweetness. T: Interesting and tasty! A little sweeter than I'd hoped; there are very citrusy hops amidst sweet malt and spicy-floral Belgian yeast. Aftertaste is obviously and pleasantly hoppy. Almost too much so. M/O: Just a little thin and abrasive at times; then sugary sweet at others. Strange. I don't think I'd have another, but I'm glad I tried it. Nice-looking beer. In a tulip it was a hazy orange color with a medium-sized white head and a good deal of lace. Yeasty, candy aroma. Orange. Spicy. The taste was a little much for me. Started off with that candy taste. Coriander noted. The orange taste was very bitter, almost unpleasantly so. It was like they put the whole rind, and not just the zest, in. Too bitter for me, and a little on the hot side. Thanks to Greg (Reagan1984) for this one - hot off the presses, bottled August 2011. Served in a Cigar City tulip. A - A thin white foam settles to an even thinner cap, thick collar, and no lace. Hazy peach body. S - Smells like a tripel, but with some citrus and tropical hop influence. There are also the standard tripel notes - stone fruits, sugary malts, some phenolic yeast, and a touch of alcohol. T - Taste is again a mix of sweets and spicy alcohol. The hop character fades to the periphery and leaves minimal bitterness in the finish. It's a bit sweet for my liking, either as a tripel or as a Belgian IPA. M - Medium-full body, lower carbonation, smooth chewy texture. Some mild alcohol warmth. 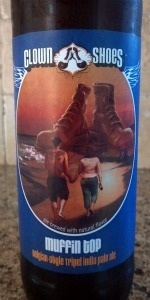 D - Well - this beer delivers exactly what it promises, a blend of American hops and Belgian Tripel flavors. That being said, the alcohol is a bit harsh, the beer is too sweet, and I don't find this particular marriage of flavors all that appealing. That being said I can see others enjoying this quite a bit. A- Body is a uniformly hazy orangish yellow hue that pours with a 1-2 finger or so foamy white head. Head quickly fades to a moderate sized collar and some lacing is left behind in the glass. When held up to the light one can see that the translucency is non-uniform with a lot of sediment around. S- The main character of the nose is belgian triple with apple, pear, peppery spice, and a lot of alcohol. There is also an over abundance of belgian candi sugar. Then there is something that seems a little off. There is a huge overtone of citrus and grapefruit with just a hint of pine and floral hops. T- Upfront is alcohol, pear, citrus,pepper, and very minor floral hop overtones with a heavy belgian candi sugar background. Finish is very boozy, sweet, and hoppy. A lot of alcohol astringency, a lot of belgian candi sugar, and a lot of pine hops. Left to linger is hop bitterness, alcohol astringency, and a weird sweetness. M- Medium carbonation with small bubbles and a slightly bready yet slightly dry, very astrigent body. O- Clown shoes is theoretically a very good brewing company- and when executed correctly the "Belgian IPA" is my favorite style- but it is important to note that this is a belgian tripel/IPA which I perceive as a hybrid between american IPA and tripel...which is much different than an intensely hopped BSPA, saison, or tripel. There is way too much sugary sweetness to this brew...and the hop/belgian blend is just executed poorly. I was really looking forward to this brew but I am very disappointed. Thanks, Kevin. Orange-y orange body, like the flesh of a nectarine. A bruised, somewhat darker nectarine. Cloudy and muddled, not surprising for a Belgian-yeast including ale. A yellow tinted, soapy and lavish head spouts like it was part of a bubble bath, taking forever to sink and leaving behind generous amounts of lacing as it does so. Hmmm... first whiff... the aroma is... peppery. Lots and lots and lots of white pepper spice, right in your face - no shame. Ashy hops, highly leafy with some minty bubblegum that leads way into the collage of Belgian yeast and applicable esters. Mildly earthy, some lightly sweet taffy, and a bit of clove and kitchen rack spices. Very, very influenced by the Belgian yeast - it basically has a stranglehold on the aroma and outshines the hops by quite a large margin. The taste is quite minty and full of clove, and it's phenolic to the core... Lots of phenolic-like alcohol which isn't too appealing, really. The Belgian yeast is center-stage yet again; chunky and gummy wintergreen spice with some sharp, black pepper on the back-end. Ashy hops squander around and try to peak their head up above the flotsam, but the surface is covered up pretty well by the heft of the Belgian yeast. Bitterness is prevalent, but so is a mild bready sweetness from the malt and the yeast, as well as a bit of a burn from the heavy alcohol character. It's a little too phenolic and medicinal in the finish for my liking. Medium bodied, not quite syrupy or sticky, but a little thicker and viscous than the first few sips reveal. Medium-high carbonation; not shocking, given the enormous head formation. Eh, I really wasn't on board with this one. Just didn't fit my flavor preferences, I guess. I do like Belgian ales, and well made tripels, but something about this one just wasn't cutting it for me. Hope you like your Belgian ales spicy and minty, because that's what this one is all about. The almost-hot alcohol presence wasn't helping either. Not awful, but not a constant rotator, either. A - Orangish colored beer with a couple of fingers of head. Little bit of random stick on the sides of the glass. S - Sweet smelling, with a lot of phenolic yeast, fruity notes. There is a good bit of hops in here also, with bright tropical fruits. Some alcohol burn. T - It's a bit sweet, both from the hops and the and from the belgian style stone fruits. It's a fairly bright beer, with some spice and some hop character. It's too sweet, kind of strangly spiced, and has a bit of alcohol. M - Medium bodied with moderate carbonation. O - Not really something I cared a lot for. Overly sweet, harsh, and alcoholic. Kind of hard to drink and the flavor profile is just a little strange. Pass. This one is unique in my experience. Advertised as an IPA/Trippel, resembles neither, but is interesting and worthwhile nonetheless. A: Almost geometric lacing. Slightly cloudy and a rich, deep copper. S: Closest thing about it to either an IPA or a Trippel: definitely gets that citrus Hop aroma IPA fans will recognize. Is definitely more sugary than a traditional IPA. T: Previous commenter was dead on, unmistakable tangerine notes here. There is the yeast heavy profile of a good trippel, but it's off a bit, a little too saccharine. Very explosive flavour. Alcohol is not at all invasive considering the ABV. M: Bready and dry; surprising bitter finish for such a sweet beer. O: If you are expecting an IPA/Trippel merger you will be disappointed. It is far sweeter than any of those have a right to be. Despite that I really enjoyed it...would never drink more than one in a sitting (and even more than about 12 oz is an ask) but a truly unique flavour. Would wish for the hops to be more prominent and the yeast to be more authentically Belgian, if that makes sense. But would still drink again. Hazy darker orange, dense offwhite head - thick lacing and fantastic creamy retention. Nose has lots of citrus/orange zest, candied malt flavours and big dry, Belgian yeast qualities. Hint of spice/clove but the American hopping and the yeast (moreso) is right at the forefront. Taste has dry yeast qualities upfront, some melon, subtle spice and bitter/herbal and citrus hop qualities. Touch of raw banana. Full feel, no alcohol (just barely) and drying. A big yeasty beer all round, fairly enjoyable. Presentation: 22 oz brown capped bottle. Illustration of an obese couple (with muffin tops...) walking on the beach towards a sunset where the Clown Shoes rest. Label framed by the Clown Shoes branding. Offers a small narrative talking about main characteristics, tongue in cheek remark about muffin tops. Shows 10% Alc. by Vol. Served in a tulip glass. A - Hazy pale to medium amber pour, rich and tall frothy head, good retention, nice surface memory, and lacing throughout. T - Mouth follows with an assertive range… Malty sense, strong caramel… sweet backbone with a citric and orange peel hop range coated in an hefty yeast character, touches of pepper and resin… Booze permeating the range. M - Medium-body+ with medium-low carbonation, oily hoppiness providing some sticky feel and an emerging booze. O - It does not drink too badly but it is a touch too hot while maintaining a nice interest. Notes: Another one aiming to define the range of a Belgian DIPA? Nice, quality, and provocative, I´m just not so sure this range is going to be much of a favorite of mine. Not liking the Tripel/IPA combo. The hop forward profile drowned everything else out. Poured into a taster glass. A clear golden straw color with a frothy white head. Nice lacing in the glass. Interesting mix of aromas with pine, citrus, floral notes, caramel, and white bread. The taste was that of a great Belgian IPA: fruity esters with American hoppy flavors as above. A nice candied orange taste on the finish. Dry and medium-bodied.